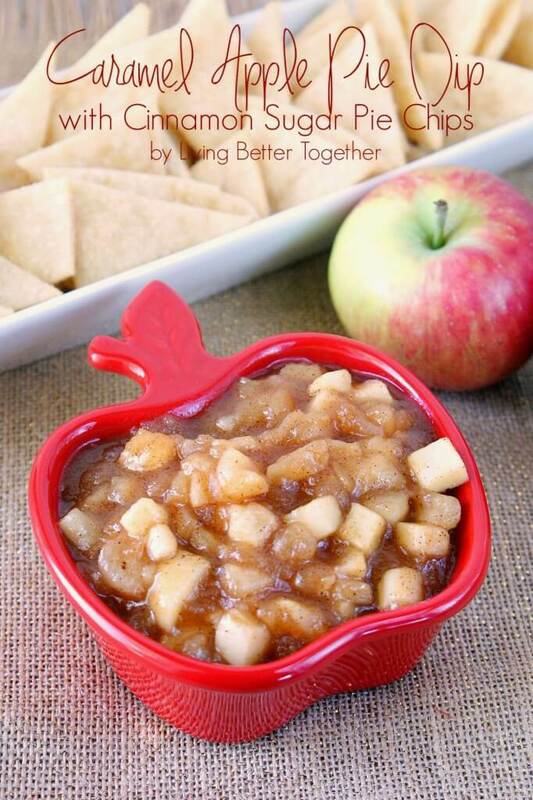 This Caramel Apple Pie Dip is a simple and delicious fall treat made from the heart of the season’s favorite pie with a touch of caramel. Well guys, I finally caved. 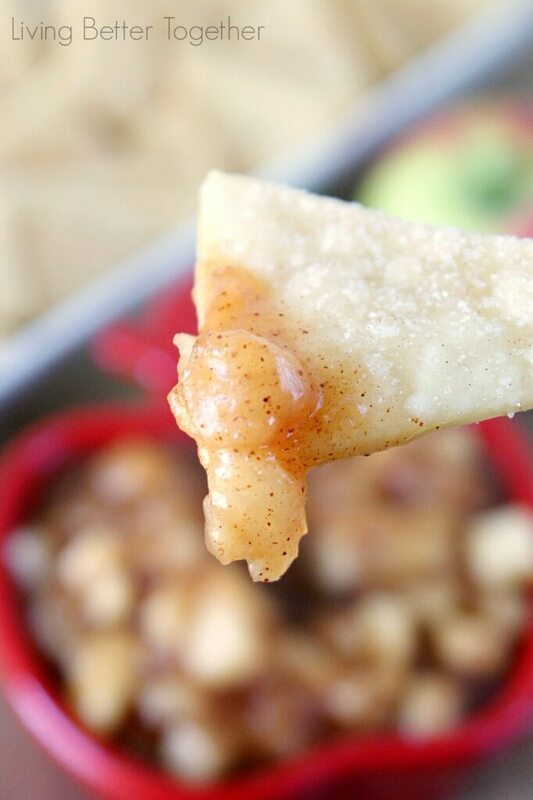 We’re going full force into Fall starting with this simple Caramel Apple Pie Dip. To me, apples are the flavor of early fall as I don’t usually start craving pumpkin treats until October. They help ease us out of the sweet days of summer and into the crisp air and changing leaves of fall. So I thought that an apple recipe would be the perfect way to kick things off. This recipe is so easy and awesome! Yup, it’s awesome… I probably would have eaten the whole bowl if there weren’t 25 other people at the party. It will however be being made again very very soon so that I may in fact eat the entire bowl without sharing! But this dip just isn’t complete without the Cinnamon Sugar Pie Chips to serve it with! 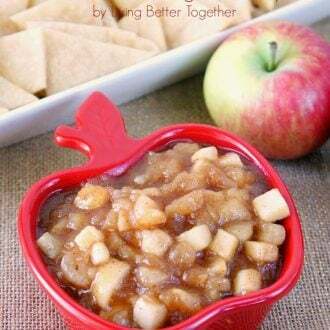 This dip is the very heart of an apple pie, it’s sweet with a hint of spice, and has soft chunks of fresh locally grown apples. 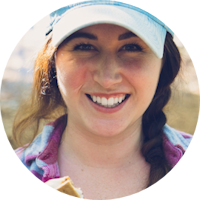 Serving it up on the the cinnamon sugar chips is just the ice cream on the pie so to speak! And let’s not forget that caramel! I’m pretty sure caramel and apples were made for each other, even more so than caramel and chocolate. This dip can be whipped up in minutes and it tastes great at any temp, which means it’s easy to transport and enjoy are tailgating parties, as a dessert at home, or even to pack in the kiddos lunch boxes. I made this dip for a family get together today as party of an apple dessert table I put together and can’t wait to share with you on Wednesday! A simple and delicious fall dip made from the heart of the season's favorite pie with a touch of caramel. Bring to a boil again and allow mix to thicken. Add in caramel at the end and pour into serving dish. 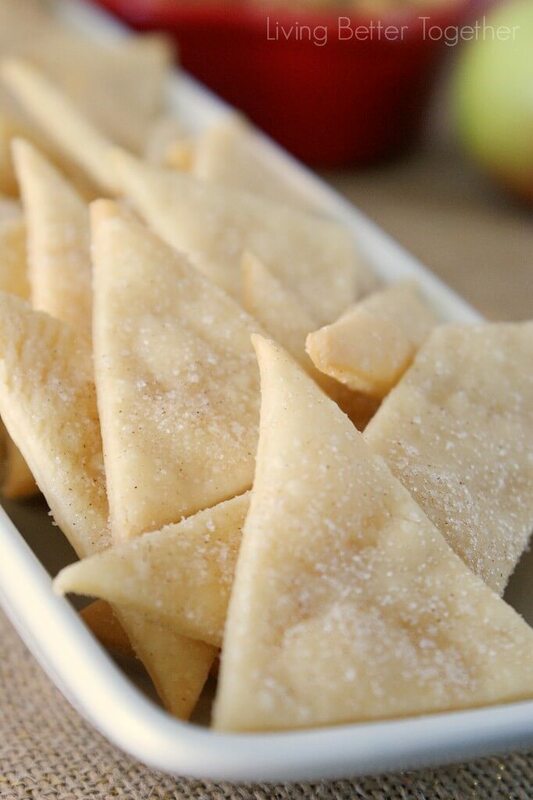 Serve hot, room temp, or cold with Cinnamon Sugar Pie Chips. This looks so incredibly good!! Yum! Love this combo, girl! Looks fantastic! Pinning! Most definitely! Everyone would love it!